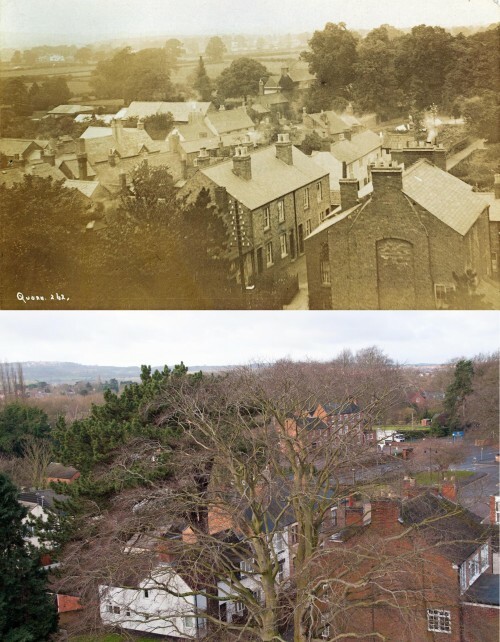 These photographs were taken from the top of the Church tower, looking towards Church Lane. The scene has changed considerably in 100 years. The older picture (approx 1910), has some large trees which block the view of the two small cottages on the left of Church Lane, which are numbers 19 and 17. The four terraced cottages, numbers 15, 13, 11 and 9 can be clearly seen on both pictures. On the older picture, you can see four cottages (numbers 1 to 7), that have since been demolished. The newer picture was taken in February 2013.